Platform 12 at Stratford station is a lonely place. Not quite as lonely, admittedly, as the tumbledown boarded-up buildings on platform 11 opposite, but pretty bleak all the same. It lies tucked away out of sight to the north of the station at the end of a twisting whitewashed subway, up which almost nobody ever ventures, and a world away from the station's busy mainline and Underground platforms. Earlier in the year this forgotten platform saw just two trains a day - one inbound from Cheshunt at about 8am and the other outbound just before 6pm. This was one of Network Rail's ghost services, of absolutely no use whatsoever to regular travellers but still sufficient to keep the line open. But as of last week, with the introduction of the new winter timetable, platform 12 now host to a full regular rail service to Stansted Airport. It's only one train every hour, which is a bit feeble for a cross London service, but it's still a great improvement on one single journey in each direction each day. Between Stratford and Tottenham Hale the new service runs along three miles of track last used for regular passenger services in 1992. This part of the route meanders along the more remote stretches of the Lea Valley, including the edge of the proposed Olympic site, with no intermediate stations or major centres of population for nearly five miles along the way. Not surprisingly the trains aren't exactly packed at the moment, but there's still plenty to see out of the window... as I discovered when I rode the ghost train at the weekend.  Stratford International: Peer north through the buddleia as the train pulls out of Stratford station and all you can see is a vast expanse of flattened building site. In the near distance surrounded by mud is a giant glass box, its windows covered by a swirling Olympic ribbon. In 18 months time this giant glass box will be Stratford International station, sparkling jewel of the East London rail network and gateway to the continent via the new Channel Tunnel Rail Link. Look carefully as the train heads north and you can see down into the new station box, a vast cavern carved deep out of the earth, and maybe catch a glimpse of several parallel rail tracks and one of the new platforms. Give it a few more years and the surrounding wasteland will be transformed into a Stratford City, a major regional development centre complete with shops, businesses and housing. It's hard to believe, rumbling past, that this nowhere will soon be a really important somewhere.  Eastway Cycle Circuit: Just before the railway plunges beneath the A12, look up to the left and you might catch sight of a silhouetted mountain biker zipping across an artificial hillock. Beyond this embankment lies East London's finest cross country cycling circuit, now doomed to be demolished and replaced by the Olympic Village and a hockey stadium. Perversely a new velodrome will then be built a few hundred yards away on land to the north of the A12, although this cycling facility ought to be permanent once the Olympics have finished.  New Spitalfields Market: Most Londoners know Spitalfields Market as that quaint building in Shoreditch where they sell stripy knitwear, mystic tat and veggie noodly-type snacks. But for three centuries Spitalfields was London's main fruit and vegetable market, until in 1991 all business moved out to new custom-built warehouses in Leyton. The new Lea valley rail service chugs right alongside, allowing you to view the exterior of this vast market building (pictured) and maybe peer in through aluminium shutters to see where London's barrowboys now ply their trade. 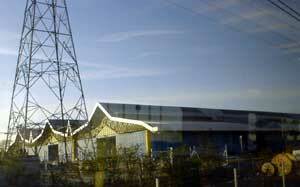  Hackney Marshes: A curving meander brings the wooded banks of the River Lea right up beside the train. The extensive marshes to the west were only reclaimed from the river sixty years ago, filled in by lorryloads of Second World War rubble. Nowadays Hackney Marshes are most famous for their record-breaking set of 87 football pitches, packed out each week with a succession of amateur Sunday league matches. A real East London institution (but, alas, partially threatened by future Olympic plans).  Walthamstow Marshes: An almost-untouched swathe of common grassland, used by local people for the grazing of cattle since at least medieval times. Only the railway intrudes across the marshes, leaving the remainder of the area as a refuge for wildlife, walkers and cyclists. A blue plaque on one of the railway arches commemorates a British aviation first - "Under these arches Alliott Verdon Roe assembled his Avro No1 triplane. In July 1909 he made the first all-British powered flight from Walthamstow Marsh". Unfortunately I got to experience the silent desolation of the marshes for a full 50 minutes thanks to an unexpected points breakdown at the junction ahead (where the Stratford line joins the existing line out of Liverpool Street). Our driver may have been helpful, informative and even sociable as we waited for signalmen to shift the rails to let us pass, but I suspect I could have reached Stansted considerably faster by coach.